I’ve just read the script for the Hull City Play of 1992 by Jon Oram. It’s called ‘Vital Spark’, which was also the name for one of my first community theatre scripts, for Moira in North West Leicestershire in 2000. Hull is a city of around two hundred and fifty thousand people; Moira a small town that grew out of the coal industry that was partly developed to fuel a nineteenth century iron making blast furnace; a wonderful building that had received funding to be renovated as an example of the UK’s rich industrial heritage. Our play was then used to help launch this new tourist attraction. Part of my thinking about where the community play has moved to is connected to this notion of the play as a tool of the heritage industry. Through looking through a database of projects funded by the Heritage Lottery Fund through their World War One: Then and Now scheme it is interesting that around twenty per cent of these projects have involved some element of community theatre either as a part of the project, or as the central element of the project. And given that the model of the community play, or at least the Ann Jellicoe version of this, is absolutely about creating work that tells a story that is rooted in the historical reality of a community, with research playing a key part of the process of creating the script, this is understandable. But what problems may this raise for the dramatist of these plays? What agendas may he or she have to confront when the play is commissioned to specifically raise awareness of heritage and history? In some ways I think that the script of ‘Vital Spark’, Jon Oram’s play, sheds some light on the dangers of this. 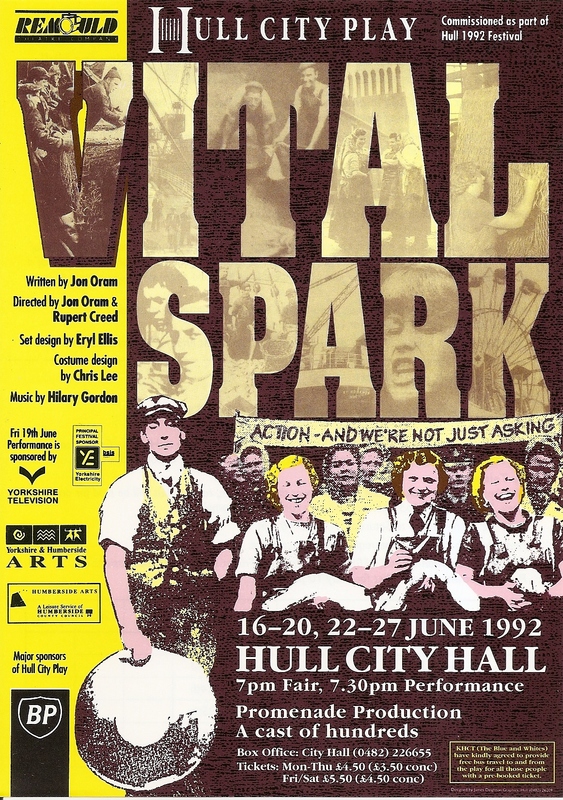 ‘Vital Spark’ was produced by Remould Theatre Company as part of Hull’s 1992 Festival. It had a cast of two hundred people and was directed by Rupert Creed and Jon Oram. I’ve been lent a copy of the script to read, part of a process of reading through as many community theatre texts as I can, and it is this that I am using as a basis for my reflections. I did not see the performance, I have not read any reviews, I have not talked to anyone involved in the production as a participant or as a member of the audience. All I have is a text. The play starts, in the Colway Theatre tradition, with ‘The Fair’. This fair is set in 1910, full of booths and barkers, and lasts for thirty minutes as a prelude to the play. It is a grotesque and picaresque affair in which we see a ‘FESTIVAL OF FREAKS’, including ‘THE FATTEST MAN IN ENGLAND and GEORGE THE GENTLE GIANT’. A banner proclaiming ‘the wondrous MAN EATING FISH’ leads into a booth in which a ‘portly gentleman devours a plate of haddock and chips’. The play then emerges from this chaotic scene (now full of suffragettes, and young lovers and young workers) as a group of itinerant players begin to perform the story of the Flood. ‘A Carnival of ARK ANIMALS are paraded through the audience as masks, banners, hats and puppets. The Fair itself ends and the focus is on the parade … EVERYONE sings’. The birth of Hull erupts from this carnival, as though in a creation myth, as the ‘sound of rain increases, add wind, thunder lightening (sic), developing into a storm’. And ‘lights rise dimly on FIELD WORKERS working to save a dyke from collapse, their clothes are covered in mud, they are themselves like the landscape, water, earth and sky’. Although there is no date given, this is the early thirteenth century, the moment when Hull comes into being as the port and the land is bought by King Edward I for use as a supply base for his military campaigns in Scotland, and founds the borough of Kingston-Upon-Hull, which is, of course, the full and correct title of the city. From here the city (‘GOLDEN CITY’) develops as a shadow puppet display and a parade of lantern carriers animates the chronological construction of ‘familiar Hull images’. But at the same time as this highly visual moment occurs ‘EVERYONE’ proclaims ‘In the gloom of mighty cities / ‘Mid the roar of whirring wheels / We are toiling on like chattled slaves of old / And the Masters hope to keep us / Ever thus beneath their heels / And to coin our very life blood into gold’. Once the city is constructed we arrive in the docks, in the early twentieth century and for the rest of Act One (p13 – p64) this is where we will stay, focussing on the story of the struggle to unionise the Hull dockers, before moving onto the First World War briefly before the interval. ‘Vital Spark’ is a stridently political piece full of scenes of dockers working, of speeches being given as the battle for unionisation proceeds, of the injustices of the hiring system, of families arguing about the need for solidarity, whilst also bringing in a subplot about the schoolchildren strikes of that same year, which originated in Hull (and a godsend for a writer when there are a large number of children to find parts for). But what is most noticeable in the text (and this may partly be because it is difficult to maintain an understanding of the through line of character when reading a script with many, many parts and so the visual components have the potential to jump through and lodge themselves in the mind more clearly) is the way that the grotesque imagery that was established with the Fair, and which then moved into a rather dreamlike and magical tone with the conjuring up of the into the vision of the ark, is now used in ways that are redolent of agit-prop techniques of theatre from the sixties and seventies. And so we see ‘A Shipping Federation Dinner’ (the bosses) in which ‘THE FATTEST MAN IN ENGLAND heads a table of huge OWNERS, some Caricature in Grotesque masks though some, those that speak are unmasked more realistic (…) The table is supported on the backs of crouching DOCKERS (…) On another stage a HUGE PUPPET HEAD of an owner opens and closes its mouth whilst DOCKERS shovel food into it like they would with coal into a ships furnace’. Scene Eighteen is called (all the scenes have titles) ‘Revolution’ and begins with ‘An image of STRIKING DOCKERS and WOMEN with Flags standing in clouds of smoke reminiscent of the French Revolution’. And by Scene Twenty Two, ‘Resolution’, there is victory as the union is recognised and there is a shift in tone as a parade through the audience is accompanied by ‘Calypso music’ and a song which begins ‘It happen rarely, once in a lifetime / The working man he win’. But rather than ending at this point of victory, the culmination of the story that has taken up most of this first act, we jump forward to 1914, seeing men leaving for war and then a scene that alternates between the trenches in France and back home in Hull. And as the act ends Nora, who we have seen throughout the play, tells us ‘And we vowed it would never happen again. But it did. 1939 Hull and the Blitz had yet to come. We were that North east town you know. London, Coventry and a north east coastal town. The war came home’. Like the first act, the second act focuses on a specific story in a specific time, here the Hull trawler tragedy of 1968 when three trawlers were sunk and fifty eight crew members died, largely as a result of unsafe working practices. Much of the story is about the women of Hull taking the lead in the industrial action this time, pressing the trawler owners and the government for action whilst many of the men wish that they would be left alone to either fight their own battles or to continue with the situation as it is because ‘if we don’t fish we don’t eat. It’s always been like that, men know the risks’. There are many scenes that I can imagine were very moving; of women waiting to hear of the fate of their husbands, of the ships sinking, of the ‘MISSION MEN’ coming to break the news and walking through the audience with their bowler hats and briefcases as ‘A Huge Winged black tattered ANGEL suspended overhead is lit’. And there is also a sense that some of this material, particularly the meeting in which John Prescott is a character, is taken directly from material relating to the campaign. Once more there is a connection back to the Fair, this time as THE MAN EATING FISH now makes a reappearance sitting at a table which ‘drips with seaweed and has at is centre piece a large silver cod trophy. Attached by ropes the table swings left to right like the motion of the sea’. He is joined by ‘TRAWLER OWNERS’ and this is the ‘Trawler Federation Annual Silver Cod Dinner … to honour the skipper who has brought in the largest annual catch’. As past and bountiful glories are recounted the ‘DROWNED’ appear, hanging upside down or standing amongst the owners. The play ends swiftly after the success of the women’s campaign for greater safety within the industry, as ‘CONTEMPORARY PEOPLE’ reflect on the death of Hull’s fishing industry and the campaigning that it spawned. And it is this memory of campaigning that is vital; that ‘we got memory an we got now. Few years ago I campaigned for a play street – and we got it’. In a rather diminuendo ending we see Nora one more time, now an old woman of ninety two, singing to a young child: ‘Incy wincy spider / climbing up the spout / down comes the rain / and wash the spider out / out comes the sunshine / and dries up all the rain / Incy wincy spider / climbs the spout again’. The message is clear; the fight must go on. Battles won in the moment are not battles won for ever. The forces which have been represented so viciously throughout the piece will continue to bear down upon you, upon your communities, upon Hull. Solidarity, organisation, action is the only way to confront them, however exhausting this may be. This is a hugely enjoyable and fast moving, fluid script that is drenched in detail, particularly in those many scenes that evoke the working environment of the dockers and the trawler men. It is easy to imagine that it was very well received in the city, especially by placing Hull at the centre of a tradition of protest and industrial action. It is full of local reference – place names, nicknames, history and myth. But it is also in this telling of the local that, as a dramatist, I can sense a tension. As mentioned earlier the first half ends with a First World War scene and an indication of what is to come – the story of the blitz of Hull during World War Two. But Act Two begins on Christmas Day, 1967. We’re given a brief recap of some of the main characters and then, through the playing of a game whereby Nora climbs under a table, we move into a kind of flashback where the characters now move into an air raid shelter as the sounds of war envelop them. This scene, like the First World War scene, is a short one, a prelude to the key action of the second half of the play. And it appears to be there because of a general ignorance about what happened in the city at that time; that ‘the wireless, the newspapers were full of the blitz in Coventry and London, but never nothing about Hull’; and that ‘no-one knows about Hull even now, not even our own’. The information that the scene imparts is interesting, but that’s what it feels like – information. And the way that the story comes out of a flashback suggests that maybe the writer had some problem with working this into the story, but that as a key part of the history of Hull it should be there. In performance this section may have found many ways to connect to the main themes of the play, but this does not come through in the script. It feels like an add on; something that should be told because this is a play about Hull and this is something that happened in Hull that not many people are aware of. And given that so many people are going to be coming to see this play, and this play moves from the origins of Hull to the here and now, that this information should be shared. I mention this because of my contention that community theatre is increasingly funded by the Heritage Lottery Fund and issues such as this – of getting in all of the history – may be something that writers and producers of community theatre have to grapple with more and more. I know that as someone who has written a number of HLF funded projects that this is a concern of mine. Finally it’s fascinating to read this play now knowing that next year Hull will be the UK City of Culture. I cannot imagine that if such a play were commissioned now that it would be anywhere near as aggressive in its political stance, and so confrontational in its representation of the class, social and economic system. But of course I may be wrong. Perhaps we are heading towards a new era of theatre where some of the techniques of agit-prop theatre – particularly the cartoonish representations of class archetypes (and maybe the recent success of the revival of John McGrath’s ‘The Cheviot, The Stag and The Black, Black Oil by Dundee Rep points to this) – becomes part of the vocabulary of theatre makers again.